DENVER, CO – Gordon Sign, designer, manufacturer and installer of custom brand expressions since 1904, was chosen to represent Colorado at ‘Made in America’ Week, where the White House celebrates domestic labor and goods by showcasing an American-manufactured product from each state. Gordon Sign attended the event after being nominated for their rich history and innovation in manufacturing neon lighted signs. In order to determine which products and companies from each state were to be showcased, the White House “asked for suggestions from the governors and members of congress to give us a list, and then, working within the different offices here, an ultimate selection was made,” according to White House Press Secretary Sean Spicer. Gordon’s signs were showcased alongside the likes of helicopters from Sikorsky, instruments from Gibson Guitars, farm equipment from Caterpillar and sandwiches from Chick-fil-A. Also displayed were crane trucks from Altec, Inc., which Gordon uses for installations. “This was a great opportunity to meet other manufacturers from different industries throughout the country,” said Max Fulton, CEO of Gordon Sign. 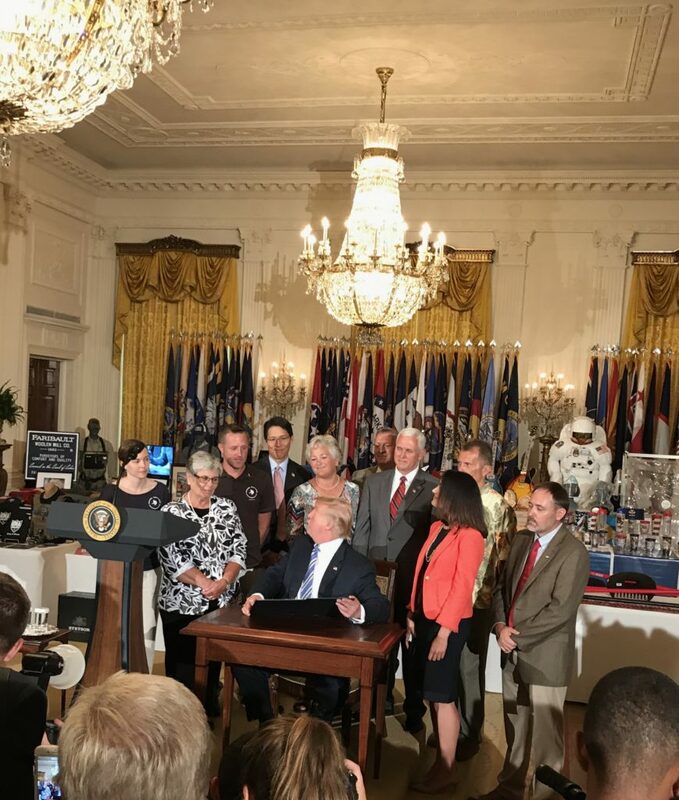 Companies from all 50 states were invited to the White House and given exhibits in the West Wing and on the South Lawn where President Trump, Vice President Pence and several Cabinet members toured the booths and conversed with the company owners. President Trump then signed a proclamation on the importance of making goods in America. 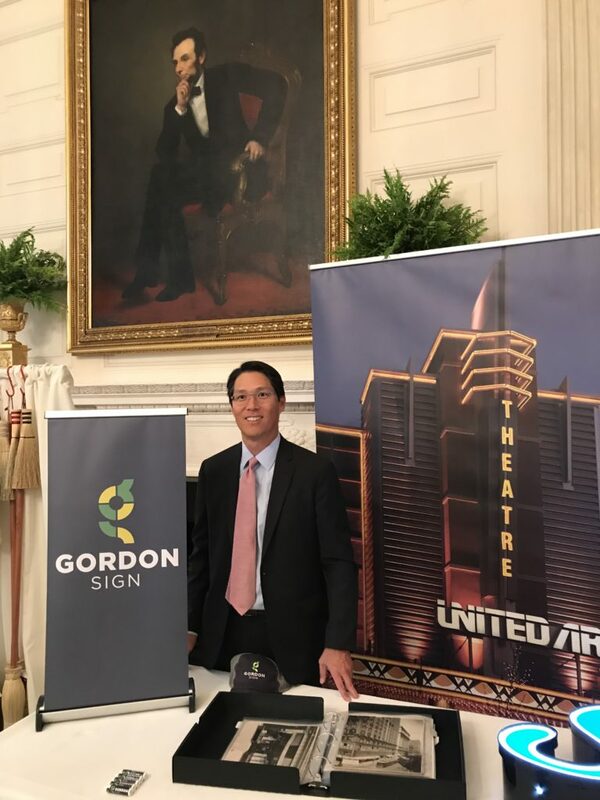 “We were honored to represent Colorado during Made In America week; being selected to represent and to highlight the workers and companies that make our country great is a unique opportunity to contribute to the economic fabric of Colorado and the United States,” said Tom Kim, President of Gordon Sign. Kim brought Max Fulton, a restructuring veteran, into the company as CEO. Fulton led a rebranding initiative and focused on creating a stronger workforce and company. He has led a number of key initiatives designed to rebuild the culture at the company. Gordon makes signs that people look up to, and they strive as a company to meet that same standard. Their portfolio represents the highest level of design, technology and expertise in the industry today. “Gordon Sign has been helping businesses expand and build their brand image through unique, custom brand expressions. We have been able to grow with our clients throughout the years,” said Fulton. Gordon Sign is the oldest full-service sign company in the country. They design, build and install several types of custom brand expressions, including directional and wayfinding signs, pole signs, monuments, channel letters, electronic message centers, and tenant displays. All of these can include elements of neon lighting. They have 43 employees, 10 of whom have been with Gordon Sign Company for over 30 years. Their CEO is Max Fulton and their President is Thomas Kim.